All the Christmas Trimmings is a wrap of cranberry red and lots of beautiful complimentary colors! Memory Wrap bracelets are so comfortable and fun to wear. They are light weight and always keep their shape. 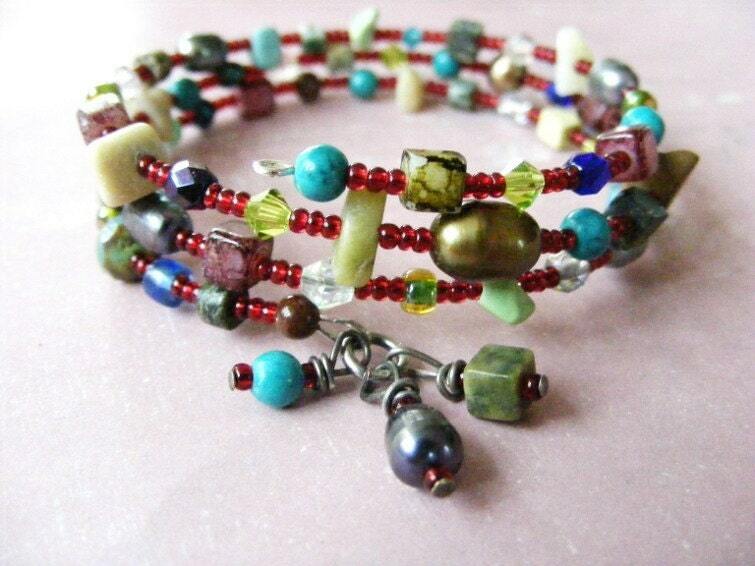 This wrap bracelet is just lovely. The little glass seed beads are a wonderful Christmas/cranberry red. Also in this wrap are: pearls, crystals, glass cut czech beads, turquoise, fire polished ab beads, yellow turquoise and more. Three wire wrapped dangle bead charms hang in front. A perfect accessory to any holiday outfit!